At CAM, we train people how to coach. Learning to coach is not easy, but at least it’s rather straightforward. What is way more mysterious, challenging, and downright discouraging is turning the ability to coach into an actual coaching practice. 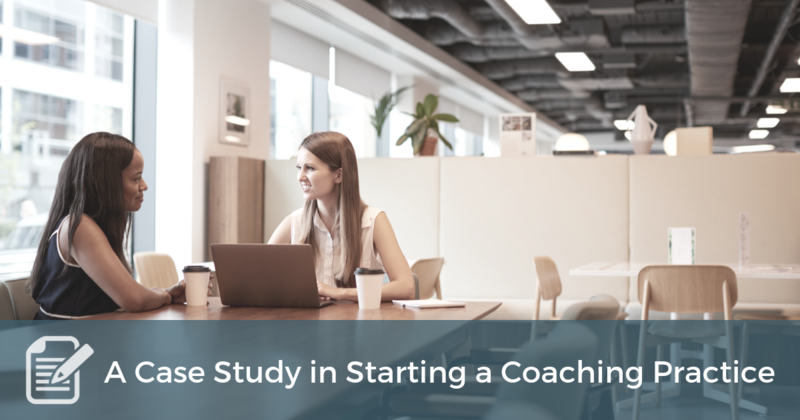 Starting, growing, and sustaining a coaching practice is not that straightforward or simple. I believe that in order to start a coaching practice, you need to have real answers to four questions. Before moving to the questions, let me say that your answers have to be good answers. What makes an answer good? That’s easy: it works. Having a coaching practice means you run a business and running a business comes down to doing what works. Don’t misread “what works” to mean breaking rules or being sleazy. Pragmatism is not the opposite of ethically owning and running a business. Cheating, lying, misleading, etc. don’t work (at least not for very long). But the feedback mirror for effectiveness in business is always shining, providing ongoing evidence for whether your answers are good ones or not. So don’t have high-horse answers that you think ought to work or should work or whatever. Life’s not unfair if your answers don’t work. Business is a grand scientific experiment based on the reality of the market, so find what works! Whom do you help with what problem? How do people with that problem find out about you? What do you offer (in addition to coaching) to help solve their problem? What are you doing today to get your next client? To help flesh this out, let’s do a case study. Not a real HBR-level case study, but an example to put some reality to the theory. If I were starting a coaching practice today, these might be my answers to the five questions. I help locally-owned businesses close the gap between what they want and what they have in three key areas: their culture, their leaders, and their teams. The common gap in culture is between a culture that burns through people, makes them miserable, and generally makes their life worse versus a culture that brings out the best in people and makes people want to work there. The common gap in leadership is between a solid individual performer versus a strong leader who has a sense of ownership for the business and knows how to bring out the best from those around the leader. The common gap for teams is between a team that’s a collection of good individual contributors who struggle to collaborate and overcome conflict versus a team that has synergy, focus, and performs at a high level. The problem for most business owners is that they are experts in their business, not experts at closing these gaps. I network locally in the places and spheres where my ideal clients are: leadership positions in my church, the Rotary Club, the Chamber of Commerce, Young Life, FCA, etc. I also pro-actively ask for networking meetings with people who serve as community mavens: people who work with the city and county, the local non-profit leaders who are well-connected, and respected civic leaders. I ask questions of those I meet with so I can better address the problems they face. Essentially, I interview them. I also share with them my vision for why I do what I do, not just what I do. (See Simon Sinek’s TED Talk). I have a website, but it’s how people find out more about me, not how they first hear about me. The goal of the website is to add legitimacy and it’s not a major effort. I also network locally through any relevant social media (Facebook, LinkedIn) by posting helpful insights related to the problem I solve. The only advertising money I spend is on boosting some of these posts. What do you offer to help solve the problem? My offer is to help the client recognize and respond to the culture, leadership, and/or team gaps. Those gaps get closed through a combination of services and part of the expertise I bring is that I can identify the appropriate methodology for the need. I offer a combination of coaching, training, and consulting. My basic offer is to invest 10 hours/month with the team or group that the business owner (or other decision maker) most wants to start with. This involves 2 team coaching sessions (which can include training + coaching) and monthly one-on-one sessions with each team member. The contract is for one year, and I can also work with more than one team at a time. The main way I get new clients is through referrals, which means I better exceed my clients’ expectations. Every day I prepare for my client engagements as if they were sales calls. I also leave room in my calendar for networking opportunities. I have one speaking opportunity every month, and I hustle to get those on the calendar. I also have at least one networking lunch, coffee, or office meeting every week and I actively seek those out and ask for them. I aim for at least one sales call each week. I want to get in front of a decision-maker in a business that would be an ideal client (or close to it). Preferably, I ask someone I know for an introduction to someone I want to know. I post one great piece of content to Facebook each week and boost one of those posts each month. Finally, I avoid things that seem like they should work as soon as I realize they don’t. Okay, I kept this relatively concise in order to be clear. And obviously there’s much more that goes into running a coaching practice, but these are the essentials. And my responses are based on the real-world coaching practice that my partners and I run. In a city of 50,000, we keep three coaches and two support persons busy – very busy. So it’s totally doable to have a thriving coaching practice. The key? Knowing what you’re doing in these four areas and doing it. What are your answers to the four questions? Do you have additional questions that are just as essential? Another great blog from you as always. I would have to say, being more aggressive and intentional about getting more referrals, seeking out networking opportunities, and scheduling in more one-on-one meetings with the kind of clients I can see myself coaching is something I definitely need to strengthen more. I so appreciate you sharing a bit from your own coaching practice approach. Such good insight and advice for us coaches here.